Where should I install the the plugins? All Graffix plugins should be placed in Adobe Illustrator’s “Plug-ins” folder. It doesn’t matter if you put it in a subfolder you create (just to keep things tidy) or at the top level of the Plug-ins folder. How do I purchase a plugin license? At the home page, select the menu item Downloads > Purchase. 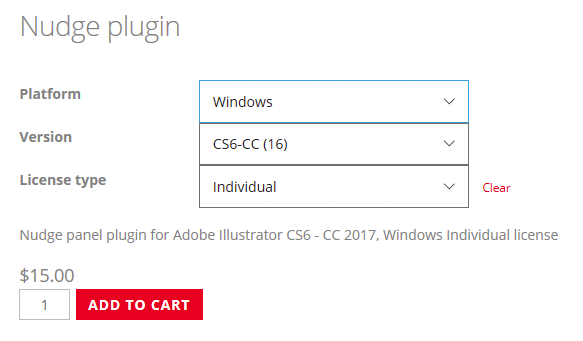 When viewing an item on the Plugins page (the one with descriptions of each one), click the “Purchase license” button. Click the Activate button in the About Box and in the next dialog, where you would enter your activation code, click the Purchase button. Select the platform, version, and license type you’d like. Specify the number of licenses (be sure to read the tab on license levels before ordering more than one!) and click Add to Cart. At the Cart page, you can enter a coupon code if you have one, then click either Proceed to Checkout or Continue Shopping. 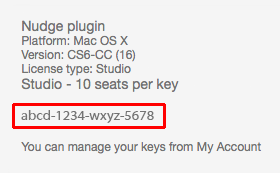 Once you’ve finished the checkout procedure, you’ll be emailed the activation codes for each of your plugins. 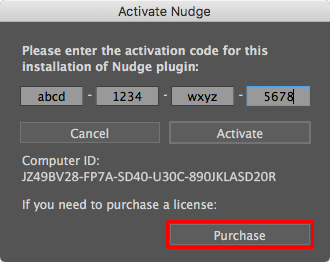 In the About Box, Click the Activate button and you’ll be taken to a dialog where you can enter the activation code emailed to you for this plugin. The simplest way is to copy the code from the email and simply paste it into the first of the four text fields in the Activate dialog. Then click the Activate button, and soon you should see a dialog confirming your activation. Perhaps you’ve reached your limit of computers allowed per the license you chose. You can launch Illustrator on a computer and, in the About box, deactivate it to free a license for another computer. Another option is to go to https://rj-graffix.com/my-account, click the “License manage” button and choose a computer to deactivate in order to free the license for another computer. If you have any difficulty in activation, contact support@rj-graffix.com. In theAbout Box, click the Check for Updates button and you’ll be taken to the Update dialog. Here you’ll be notified if there is an update available for your plugin. Click the checkbox to enable to disable automatic version checks. You can also change the number of days between version checks. Clicking Not Now will apply any changes you may have made to the update settings, without downloading anything. 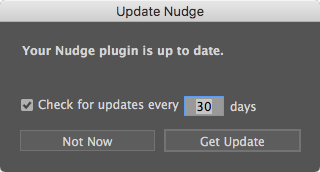 Click Get Update to download the newest version of your plugin. It does this by opening your browser and downloading to your default download folder. Why do the plugins require an internet connection? 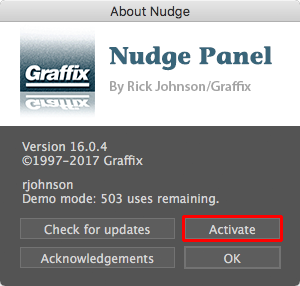 Beginning with version 16 of Graffix licensed plugins, an internet connection is required to change your activation status and, for all plugins including freeware, to check for software updates. Please be assured that this requirement is to make the licensing process fair and flexible, as well as to make availability of updates known to users. Anonymous data is periodically verified to improve the online experience for the user by catching bugs or inefficiencies in the website, but under no circumstances will your personal information be gathered or sold to others. Never ever. A plugin doesn't load, or crashes Illustrator on launch. The most common cause of this is a mis-matched plugin. For example, a Windows plugin won’t load on a Mac, and a CC plugin won’t load in CS6. Perhaps the plugin isn’t installed in the proper directory (the locations are listed in the installation section above). If you’ve verified the plugin platform, version, and location, and it still doesn’t seem to load, perhaps it did load, but doesn’t appear where you expect to find it. Please check the next section and, if that doesn’t solve the problem, please contact rj-graffix support for help. A plugin loads, but doesn't appear in Illustrator. To be sure the plugin loaded, look for its About Box. If there’s no About Box, please see “A plugin doesn’t load” above. If About… is there, then the plugin should be loaded, too. If you’d used Graffix plugins before CS6, you may recall that they were first found under the Filters menu, then when Filters was removed many moved to Object > Filters. Beginning with CS6, all plugin interfaces can be found among the native Illustrator tools, menus, and palettes. Please read the short Read-me file that comes with each plugin to see where the interface items are. If it’s not where the doc says it should be, please contact rj-graffix support. Where has the older software gone? I’ve rewritten (from scratch) my plugins for Adobe Illustrator CS6 and CC. The CS3-CS5 versions are still available here on this site, and some of my older web pages are still here in case you’d like to browse or even download items from “the archives.” You can still purchase a registration code for these, although the automated system via the defunct Kagi no longer works. I’ll generate and send a code manually. Tip: purchase a current plugin and I’ll add the legacy version upon request. That way you can upgrade when you’re ready. If you have other questions or need assistance, please ask at the Contact page.